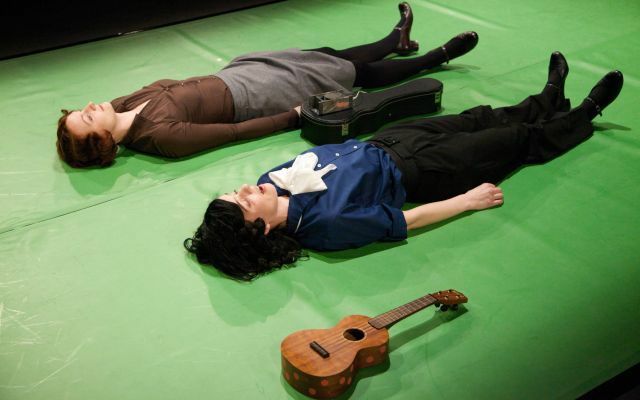 Lone Twin Theatre are presenting The Catastrophe Trilogy at the Barbican this month, comprising the previously performed Alice Bell and Daniel Hit By A Train and a brand new piece The Festival. 'Catastrophe' suggests high drama and a downbeat experience; you'll get neither from Lone Twin Theatre: the focus is on the quiet heroes of everyday life and the act of story-telling. "We're always telling stories," explained one of the artistic director Gary Winters (Gregg Whelan is the other). Alice Bell, 'part DIY musical, part fairy-tale' shows life as an act of hope, Daniel Hit By A Train pays tribute to the heroes in Postman's Park, and The Festival is about two lives crossing and how everything changes at that moment. "We found that people would ask us what we were doing when we were out doing a public project and those encounters always led to storytelling; we're always telling stories. And we didn't see each piece as a standalone thing but a way of continuing to work together as a company. There was no proposal for a single subject in the trilogy but there is continuity in scale and intimacy in each piece; the dancefloor changes colour but stays the same size and we always work on a traverse stage... The background is people in all our shows, it's always a populated space." Which is what Lone Twin Theatre captures in each performance, the presence of real people in even the most fantastic of stories. You can see each individual piece separately on weeknights until 13 March, or book the whole trilogy on Saturdays, including a walk to Postman's Park between performances, to see the handcrafted ceramic memorial tiles that inspired Daniel Hit By A Train. When asked what would be a fitting tribute to a modern day hero, Winters paused, then suggested "... an iPhone app?" There may be downloadable tribute apps in the future but until then, there is Lone Twin Theatre, keeping hope and faith in the strength of the human spirit alive in their work. The Catastrophe Trilogy at the Barbican, until 13 March. For more information and to book, go to the Barbican website.